PLW: A laddered treasury means that the ETF holds treasury bonds of different yields and different sequential maturity dates. General Risk: You need to further evaluate PLW thoroughly. Well-informed, you decide what to do. Remember that there is risk of loss in all trading. I don’t own any PLW shares. Here are the pluses and minuses. + Monthly Dividend: The May dividend was $8.70 per 100 shares. SEC yield is 3.33%. – Inflation Risk: If inflation increased to 4% and the PLW’s yield were 3.33%, the bond holder would consistently lose money. + Default Risk: There is very little risk of default with treasury bonds. – Expense Ratio: .25%,The median treasury bond ETF expense ratio is .15%. + Beta: A negative beta means PLW moves inversely to the S&P 500. 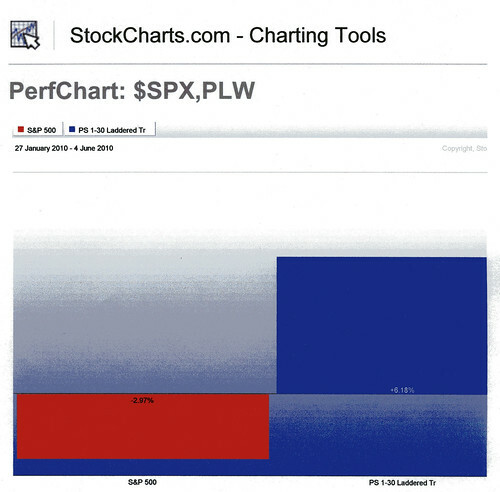 A person wanting to hedge his portfolio could use PLW. Also, the beta indicates low volatility for PLW. + $SPX/PLW Comparison Charts: As of 6/4/10 ending a 90-day period, PLW has increased in price by 6.18% whereas the $SPX has decreased in price by 2.97%. 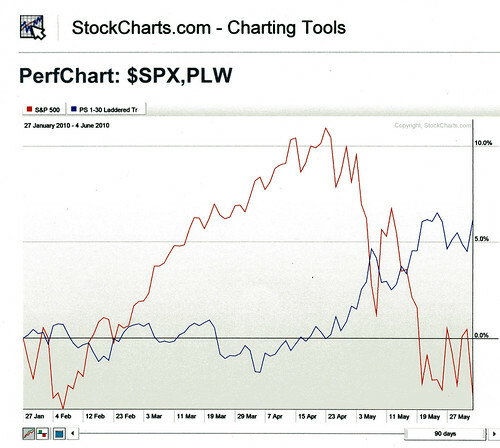 This means that PLW has increased in price by 9.15% more than the $SPX for the last 90 trading days.